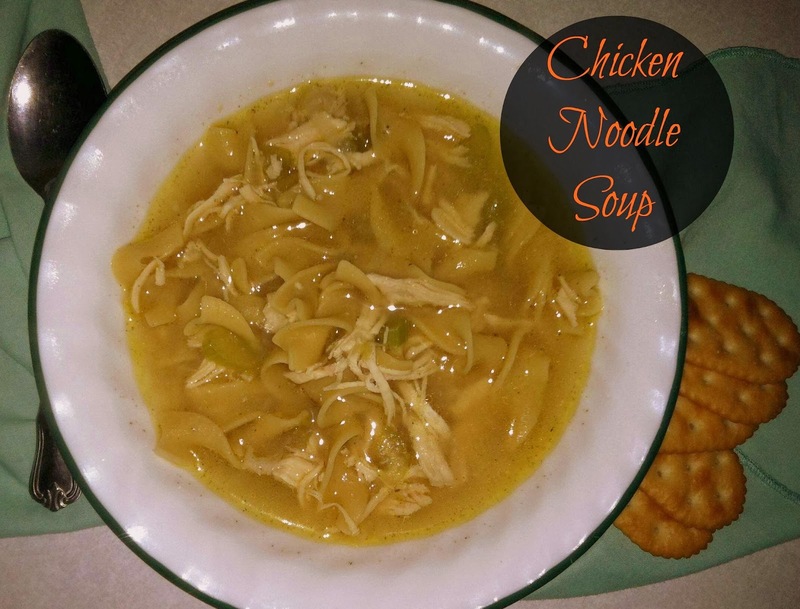 I've never really tried to make chicken noodle soup before. It's always been chicken and noodles, beef and noodles...never in a "soup" before. So yesterday I decided to give it a whirl. I knew making a soup couldn't be too difficult, and I was right. It wasn't too hard at all. In fact, I rather enjoyed how simple it was to make. The best part is that it tastes way better than the canned soup. Woo hoo! The longest part was boiling the chicken breasts. I could have cheated and bought a rotisserie chicken, but it is way cheaper to just cook up some chicken yourself. I opted to leave out carrots because my family doesn't think they like cooked carrots, in anything. So it isn't as colorful as I wanted it to be, but what it lacked in color, it made up for in flavor! In a medium saucepan, fill with salted water and bring to a boil. Add the chicken breasts and cook until no longer pink. Remove the chicken from the water and shred however you'd like; set aside. In a large stockpot, melt the butter. Add the oil, onion, celery, garlic, poultry seasoning, and salt and pepper to taste. I added a couple teaspoons of each. Cook until the onions are clear and the celery is tender. Add the chicken broth, bouillon cubes, and water. Add the egg noodles and shredded chicken. Bring to a simmer and let cook until the noodles are as tender as you'd like. Serve with extra seasoning, if desired, and crackers.